The other day, my coworker gave me a recipe for mshabak, a doughnut-like pastry popular in Syria, Egypt and Lebanon. The dessert, which is typically served on holidays, is piped into spirals and deep-friend much like funnel cake. The Syrian variety is made from an unsweetened dough containing yogurt, semolina, and rosewater. After frying, the pastries are soaked in a sugary rosewater syrup. I modified my coworker’s recipe slightly, shaping the dough to resemble beignets and frying them in a minimal amount of oil. 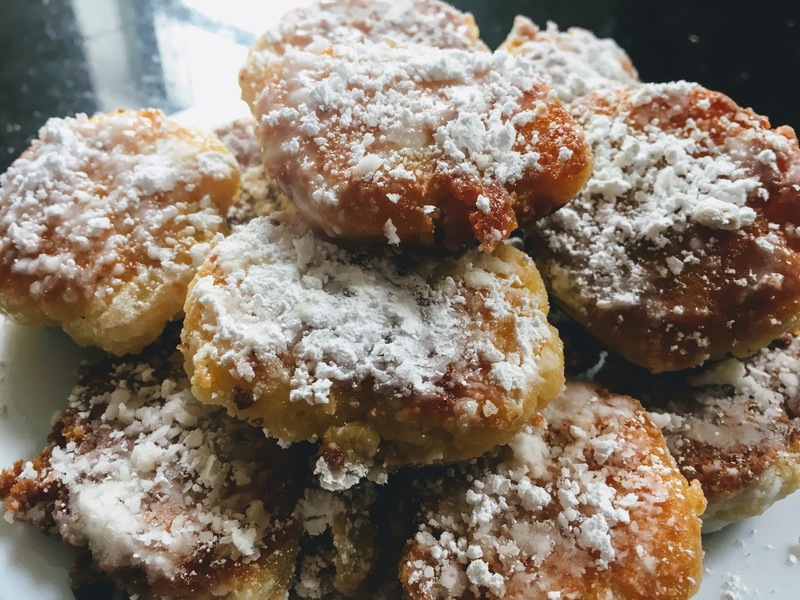 I coated the pastries in a mildly sweet milk and rosewater syrup that I invented on a whim, and rolled them in powdered sugar. The result was a doughnut that wasn’t too sugary or oily, with a delicious rosewater flavor. The ingredient list for the dough may seem long, but the process is simple: all the ingredients are mixed together in a single bowl, and order doesn’t matter. Prepare the dough: In a large bowl, mix all ingredients together. Cover and set aside for two hours. Prepare the syrup: In a small bowl, stir together sugar, milk, and rose water until smooth. Set aside. Fry: Fill a medium-sized sauce pan with 1/2 cup of oil, and heat over medium-high flame. Roll heaping tablespoons of dough into balls, and gently place in the oil. Be careful not to place too many doughnuts in the pan at once, or they will be difficult to flip over. Fry until golden-brown, about 3-5 minutes on each side. Remove from oil using a slotted spoon, and place on paper towel to absorb excess oil. Coat: When doughnuts are just cool enough to touch, dip in syrup until fully coated, then roll in powdered sugar. They are best served right away, but leftovers can be stored in the fridge.